A set of watershed models for four basins (Crab Creek, Rocky Ford Creek, Rocky Coulee, and Lind Coulee), draining into Potholes Reservoir in east-central Washington, was developed as part of a decision support system to aid the U.S. Department of the Interior, Bureau of Reclamation, in managing water resources in east-central Washington State. The project is part of the U.S. Geological Survey and Bureau of Reclamation collaborative Watershed and River Systems Management Program. A conceptual model of hydrology is outlined for the study area that highlights the significant processes that are important to accurately simulate discharge under a wide range of conditions. The conceptual model identified the following factors as significant for accurate discharge simulations: (1) influence of frozen ground on peak discharge, (2) evaporation and ground-water flow as major pathways in the system, (3) channel losses, and (4) influence of irrigation practices on reducing or increasing discharge. The Modular Modeling System was used to create a watershed model for the four study basins by combining standard Precipitation Runoff Modeling System modules with modified modules from a previous study and newly modified modules. The model proved unreliable in simulating peak-flow discharge because the index used to track frozen ground conditions was not reliable. Mean monthly and mean annual discharges were more reliable when simulated. Data from seven USGS streamflow-gaging stations were used to compare with simulated discharge for model calibration and evaluation. Mean annual differences between simulated and observed discharge varied from 1.2 to 13.8 percent for all stations used in the comparisons except one station on a regional ground-water discharge stream. Two thirds of the mean monthly percent differences between the simulated mean and the observed mean discharge for these six stations were between -20 and 240 percent, or in absolute terms, between -0.8 and 11 cubic feet per second. A graphical user interface was developed for the user to easily run the model, make runoff forecasts, and evaluate the results. The models; however, are not reliable for managing short-term operations because of their demonstrated inability to match individual storm peaks and individual monthly discharge values. Short-term forecasting may be improved with real-time monitoring of the extent of frozen ground and the snow-water equivalent in the basin. Despite the models unreliability for short-term runoff forecasts, they are useful in providing long-term, time-series discharge data where no observed data exist. 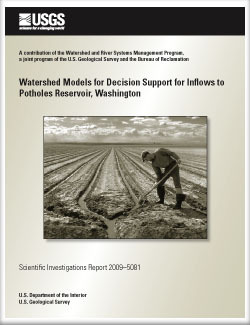 Mastin, M.C., 2009, Watershed models for decision support for inflows to Potholes Reservoir, Washington: U.S. Geological Survey Scientific Investigations Report 2009–5081, 54 p.